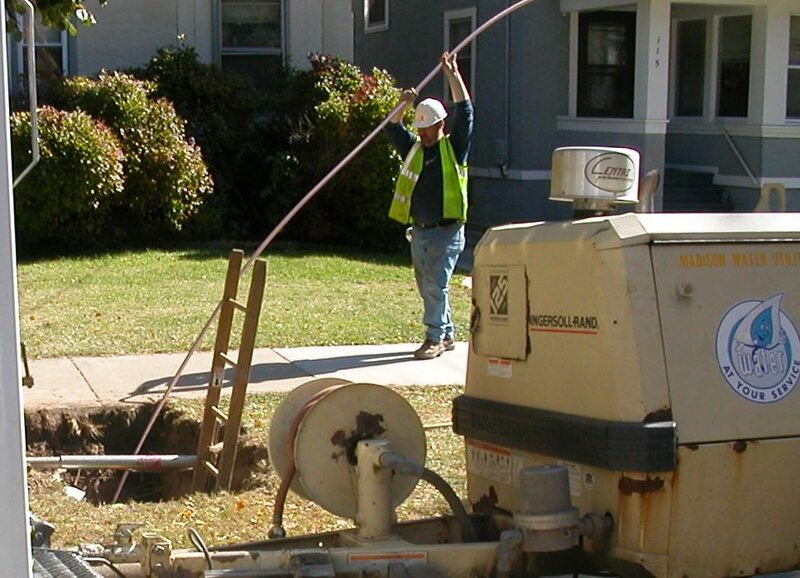 From 2001 to 2011, crews in Madison, Wisc., replaced more than 5,000 private lead service lines. Madison has long been known as a center of progressive thought in Wisconsin and, lately, as home to a Big Ten basketball power. But a plan in the 1990s to replace its lead service lines was anything but a slam dunk. How it unfolded there could be a cautionary tale for the complexities that cities like Flint may face as they go about removing lead lines from their water systems. Two decades ago, city officials in Madison decided that replacing its lead service lines was the best way to assure its drinking water would be safe. They thought the alternative – treating the water with orthophosphate, which creates a protective coating inside lead pipes – could be costly and pose a potential pollution threat to lakes and streams if not treated by the Madison Metropolitan Sewage District. By the mid-1990s, the utility had begun removing lead service lines, but only on that part of the line owned by the utility – from the water main to customers’ property line – and not at the customer end. Eventually, though, the utility company decided that was not sufficient. “We looked at that and decided it doesn't do much good if you don't replace the whole line,” Piper said. But a full replacement posed a dilemma: In addition to cost, the utility would have to get customers to agreed to replace that part of the line going into their house. That's a big challenge for municipalities considering removal of lead service lines, since most only own or control the line up to a homeowner’s property line. The utility originally intended to charge its 65,000 ratepayers for the project. But the Wisconsin Public Service Commission rejected that, stating it would set a precedent that would allow other utilities to force customers to pay for private property upgrades. The local paper, the Wisconsin State Journal, weighed in. “There is little, if any, evidence to suggest that lead pipes in...older Madison homes pose more than a theoretical health hazard to the occupants of those homes or anyone else,” the paper warned. In the spring of 2000, after months of debate, Madison’s city council narrowly approved the utility's lead service replacement program – from water main to house – with a projected cost of $19.4 million. It was the first of its kind in the country. Initially, replacement of the private side of the service line was to be funded by charges already directed to the sewage district, since it would save money the district would have to otherwise spend removing orthophosphate, which can feed algae growth, from the water. An estimated 6,000 customers with lead service lines were to be reimbursed for half the cost, up to $1,000. Under this plan, customers would be given no choice: replacement was mandatory. The city turned instead to another fund, monies paid by cell phone companies for antennas on the utility's water towers. That paid for $3.9 million in reimbursements to customers, who in turn paid about $4 million, an average of $675 per homeowner. The project was completed in 2011. Piper estimated the utility replaced about 8,000 service lines on the utility end, at a cost of $12 million, with more than 5,000 homes needing private lines replaced as well. The task was more straightforward in Lansing, the second city in the nation to embark on replacement of all lead service lines. Lansing's Board of Water and Light spent $42 million over the last 12 years to replace 13,500 lead lines, with a few hundred such pipes still to be replaced. Ratepayers are footing most of the bill. Spokesman Steve Serkaian said it didn't face the issues vexing Madison, since the Lansing utility controls the entire service line. It is the exception to the rule in Michigan - most utilities only own or control the service line to the property line. “We own the line from the curb all the way to the meter,” Serkaian said. Experts say that, in places where utilities do not own the entire line, the approach taken by Madison is wise. Replacing only a portion of a lead service line can be worse than doing nothing at all. That's because that replacement process can jostle free built-up lead in the line, releasing it into the water. “There is no doubt that partial lead service line replacements can result in significantly elevated levels of lead in tap water and that this contamination can continue for weeks and months,” said Environmental Protection Agency chemist Michael Schock. In Madison today, 90 percent of homes test with lead levels below below 3 parts per billion – about one-fifth the federal action threshold of 15 parts per billion. The detectable lead levels are most likely due to lead solder and leaded brass used in many homes’ interior plumbing, practices banned by amendments to the Safe Water Drinking Act in 1986. Experts say you won't get to zero unless those pipes are replaced as well. Any level of lead remaining in the water system is less than ideal.